Get To Your Beach Vacation! Not sure what your transportation options are to get to Tampa Bay and Tarpon Springs, or for departing after your beach vacation? We’re here to help. Several airports and seaports service Tampa Bay and Tarpon Springs, so you’ll have plenty of options. Most visitors to Tampa choose to fly through the Tampa International Airport. This airport is a major hub in Florida, with over twenty major airlines flying in and out of the airport every day. Over 85 non-stop destinations are served throughout North America, South America, Europe, and more. It’s also full of amenities and creature comforts. Conde Nast rated this airport as one of the top 3 airports in the country in 2016 – citing its large size, efficiency, and variety of dining, shopping, and recreation options. To get to Tarpon Springs, you’ll likely have to rent a car, or charter a shuttle to your destination, as this airport is a bit farther away than St. Pete-Clearwater. St. Pete-Clearwater International Airport is located just north of St. Petersburg, and west of Tampa. It’s a bit closer to Tarpon Springs, but you will probably still need to rent a car to get to your destination. Most low-cost carriers come to St. Pete-Clearwater. If you are looking to save money on airfare, this airport is your best bet. Allegiant Air is one of the primary carriers here, offering budget tickets to vacationers. While it’s much smaller than the Tampa International Airport, there are still plenty of amenities, and it’s one of the most quickly-growing airports in the region. Sarasota-Bradenton International Airport is located south of St. Petersburg and Tampa. If you are interested in exploring multiple areas along the Gulf Coast, flying into Sarasota-Bradenton is a great idea. 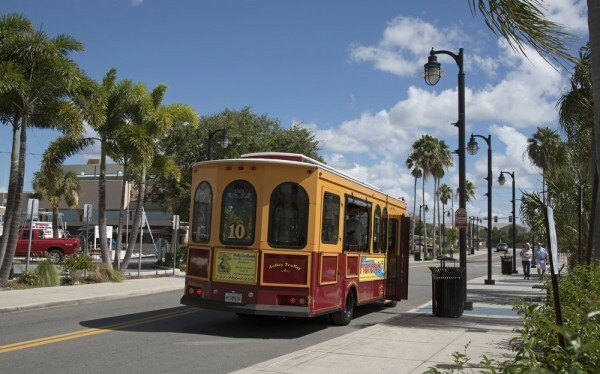 You can drive up the coast, and stay in multiple places to experience everything that Florida has to offer, before arriving at Tarpon Springs. Sarasota-Bradenton is also close to major Florida parks like The Myakka River State Park, so it’s a good choice for outdoor enthusiasts. Grab your gear, rent a car, and head to the State Park – then drive up the coast to the sandy beaches and gorgeous golf resorts of Tarpon Springs. The Port Of Tampa is still a very large passenger hub. Many cruises in Tampa use The Port Of Tampa as a departure point. Carnival Cruise, Holland America Line, and Royal Caribbean International are just a few examples. Typically, most cruises depart from Tampa – so you probably won’t be able to get a cruise that has Tampa as its destination. Your best option is to either drive down to Tampa if you are within a few hundred miles or to fly into the Tampa International Airport to catch your cruise. You don’t just have to enjoy the cruise, either! You can book a stay at Tampa for a few days before and afvter your cruise – and enjoy Tarpon Springs, and all of the other gorgeous beaches and resort towns near Tampa. Get To Tampa – And Get Your Beach Vacation Started! If you’re interested in the beach vacation of your dreams, but you’re not sure where to start, this guide should help. These are your best options for traveling to Tampa and around Florida. Whether you’re looking to fly directly into The Gulf Coast or take a detour into Central Florida, you’ve got plenty of options. So get down here, rent a car, and start exploring. You’ll love everything that Florida and the Tampa area has to offer – guaranteed.